Blind faith in climate models | Watts Up With That? “The Parliamentary Under-Secretary of State, Department of Energy and Climate Change (Baroness Verma) (Con): The UK government has made substantial investment in research that concerns the likelihood and timing of future changes in global and regional climate. So, presumably the UK Met. Office used the IPCC models to prepare this reply. It is given in the House of Lords, by a Peer of the Realm, so by the rules of the British Parliament, it OUGHT to be accurate. Since the climate models are completely incapable of producing accurate predictions, the answer given by Baroness Verma is little more than a pack of lies. It was this sort of statement by the Met. Office a few years ago that persuaded Heathrow Airport not to invest in snow clearing equipment, so the a mere 5 inches of snow closed one of the busiest airports in the world for several days. 5 inches of snow here is Ottawa, Canada, would barely cause any delays in service. Surely it is about time that someone with both authority and courage to stand up and say this nonsense of CAGW must stop before even more damage is done. Thank you Anthony. What an honor! I don’t ask this as a put down, I genuinely want to know. I so agree. The cat’s been out of the bag for awhile now, the models thoroughly debunked, predictions AND projections one after another wrong, year after year after year. A rhetorical question now: After 30 years of getting it wrong, why are these people allowed to continue with the meme, continue to draw much needed money down the green tubes, continue to cause global disruption to economies, the environment, civilization, health and safety? Why? This is what the MSM should be asking. This is what every citizen of every country should be asking. Alarmism is destroying the world on many layers to a noticeable extent now. And people everywhere just sit back and watch? I’ve said it before, I’ll say it again. Pull. The. Plug. All Ican think is to force a Judicial Review – if a lawyer could be found to act pro bono. I indicated a similar distrust of models on the excellent Climate Etc site and the comments showed that the academic scientific community seems to support AGW to the hilt, despite any temperature hiatus or any other contrary evidence. We are up against a belief system that defies logical thought or scientific integrity. I don’t know how to argue with that using conventional scientific argument. Uh wait they forgot to say. hmmm. Was this meant as an opinion piece and not one describing our knowledge and data on the topic? Im shocked so many otherwise intelligent folks still think this is science based. A blizzard this month killed tens of thousands of cattle in western South Dakota. To find the answer to that we must, unfortunately, ask why the faith is clung to by those in power. The answer (now) is that they are committed to it. The world is ending and if you doubt that then the precautionary principle is invoked. No-one wants to be seen as reckless. Do you? So don’t be partisan; every side is committed to folly. You will just look like a dangerous person to be associated with. That is self-defeating. Instead make the costs of fear well known. Higher energy costs today are deadly. Let the alarmists defend their costs explicitly. If they keep raising the downsides for tomorrow they will become more and more ridiculous. You don’t beat a lie with a lie. Both are rootless and will grow as parasites – indistinguishable in the long run. You beat a lie with laughter. The good Baroness has almost certainly uttered her own epitaph, perhaps along the lines of Dr David ‘children won’t know what snow is’ Viner. She’ll be hung out to dry on this falsifiable statement. Tough. But her husky hugging boss will defend her out of loyalty, I for no other reason. She needs to be shown to be costly in her folly not merely wrong. A lot of politicians are on record as being wrong. The global temperature use the sea water level to imply any warming and the temperatures are adjusted. The sea level models rely on the global temperatures so this is adjusted. Is this what is happening? Is this why a constant stream of tiny upward adjustments are being made to both and are always far, far too high? Datasets are assumed unadjusted when at the very base they have very well been adjusted upward. That’s a no no in basic science 101. I don’t see how they cannot be do such. Monckton, get in there and straighten this out, before tea time tomorrow, of course. given the time of year, I’d suggest a few barrels of gunpowder! I wish I knew. The one suggestion I have made before is that Princeton University should issue a statement, with the full authority of the University, that contradicts the statements by the RS, APS, AGU, etc. I am, of course, thinking of Ken Haapala.. Then at least we would have one academic institute in our corner. They have too much invested in this business for them now to turn around and admit they are wrong. And unfortunately it could be decades before they are proved conclusively wrong. Till then they can continue to string things out by blaming everything under the sun for the lack of warming while maintaining it will return soon. Certainly in the UK, the voters get very little choice, as all three main parties sing from the same sheet. Only UKIP stand out alone, and the electoral system means they have no chance of even winning a few seats, never mind a majority. So the best the IPCC could come to explaining the current lack of warming was saying that natural factors caused this. Exactly. In their statement they suggested various things: volcanoes, hiding heat, etc., but they assigned low probability to each of these explanations–at least quite a bit lower than their 95% certainty on CO2. So basically the latest summary is that the warming trend has been blocked for 17 years by . Until some definitive science is done on the potential magnitude and schedule of , it seems unjustified to assign a high certainty to their pet cause. Second try. Editor played a trick on me. Exactly. In their statement they suggested various things: volcanoes, hiding heat, etc., but they assigned low probability to each of these explanations–at least quite a bit lower than their 95% certainty on CO2. So basically the latest summary is that the warming trend has been blocked for 17 years by UNKNOWN. Until some definitive science is done on the potential magnitude and schedule of UNKNOWN, it seems unjustified to assign a high certainty to their pet cause. You had it at ‘power’ — “policy-relevant pathways”. Any port in a storm. Endless hobgoblins. You can keep your healthcare if you like it. It takes a village. Pick your adage. The Emperor whose new clothes were admired by all the Imperial Clothiers, the Royal Guild of Weavers, the Household Dressers, and all the other accredited experts was confounded when a mere child pointed out that His regal PP was showing. Scientists at the East Anglia Community College have explained how the IPCC arrived at 95 percent confidence that humans are the cause of most of the global warming of the past 60 years. The good baroness merely consulted the usual soothsayers, and so remains ignorant of the impending reality. And as for, we have another 10,000 years to go before the Holocene ends, I can only think that the British Antarctic Survey can’t been to the Antarctic recently. This has been looked at and debunked. Perhaps she got her nautical vessels mixed up and consulted the crew languishing in Murmanski jails. If flip flop Lockwood’s current line of research holds up then this period of cooling we about to embark on will be the most rapid since the last glaciation. Something that is hardly suggestive of the Holocene holding out for a further 10,000 years. I appreciate that Milankovitch orbital variation shows a slower decent than the last few glaciations, but not sufficient to support the idea that we may get a further 10,000 years. We don’t need to drop all the way into a glaciation, which can be a drop of 10 degrees, before we can no longer grow food in the Northern hemisphere. Seriously, I’m starting to think that the UK Met and the House of Lords (bar Lord Monckton) is becoming another Gore Effect Predictor. Which bodes ill, in the context, for expectations of Indian Summers, and the Tulip Festival here, in the decades to come. Regards Merry Old, it’d be damn tough – what with energy prices in the Isles. I’d engage in schadenfreude given how much of this junk has been generated out of England, but the Pols can well afford the fur (faux or otherwise) coats, and it’d be the wage-slaves, per usual, who’ll get it in the neck (or fingers ears and toes, more properly). In the Future, no one will believe, that no one went to Jail over this virulent propaganda. This comment points out a neglected cost of the inordinate devotion of resources to warming alarmism. It is clearly all about the money. Investments in warmist research and projects seem to exceed $1B per day worldwide and I believe that is but the tip of the iceberg. It is also a useful stimulus for voluntary contributions from the faithful. Anyone who has been involved in research knows that if the funding agencies seek work on a subject, then the researchers try as hard as possible to propose their work to fit that topic. Often it has been largely harmless diversions, such as when catastrophe theory, chaos theory, neural networks, artificial intelligence, etc enjoyed brief high priorities in funding. In those cases researchers dutifully relabeled what they were doing as whatever was likely to get funding to increase chances of funding. After a short time, the momentary flush of popularity of the topics subsides to a level more in keeping with the actual contribution of the idea to research in general. Usually, such things have not diverted tremendous resources over the long term. The truly sad part of the CAGW issue is that it has maintained such a long term, high proportion of the limited research and development resources to the detriment of other, far more pressing research areas. To name a few that could use $1B per day profitably: the antibiotic resistance crisis, pandemic flu and other pathogen responses worldwide, ongoing prevalence of needless illness in the third world due lack of sanitation and medical access, endemic lack of food and energy access in the third world, etc. Those are just some hard science areas. In the social sciences, addressing the causes and effects of violence and exploitation worldwide would be a far better use of resources than investigating how strong the CAGW “consensus” is or what characteristics “deniers” or proponents have in common with conspiracy theorists. There are very real, present and near term threats that could use these resources to save and improve lives that are being wasted due to CAGW nonsense. Another sad consequence is that CAGW has hijacked the environmentalist movement. There are urgent environmental issues needing attention in the world, some of which I mentioned above involving managing living conditions throughout the third world and developing world, and these issues are being overshadowed by the CAGW nonsense. As a consequence, millions of men, women, and children are dying every year or suffering stunted lives. The continued insistence on funding agencies and the supported performers in doing work of demonstrably no use whatever to bettering the lives of the world is self serving and shameful to any scientist of conscience. There are none so blinds as…..I am proud to say the voting public of Australia have seen and overwhelmingly rejected the Carbon (Dioxide) Tax. And I suppose that Mammoths found flash-frozen in the Arctic with stomachs full of undigested roughage and in need of toothpicks for the flowers between their teeth, count for nothing in this confident projection of “10,000 years till the next glaciation”. We don’t have the faintest grasp (yet) of what drives Climate, in our Electric Universe. But we can be pretty certain it ‘ain’t us’. “They Want To Blame You”. Get ready for it. Diocletian’s Problem, Reaction, Solution applies, full force (Cloward-Piven; Agenda 21; All Aboard to Save the Planet)…and it’s Us against Them. When can we start measuring these dumkoffs and criminals for their pink prison suits, a la Sherriff Joe’s Arizona brigade? Lord Lawson of the GWPF who has speaking rights in the House of lords should be able to challenge the bad baroness in the house. I’ve deleted my first attempt at a reply – too long, too angry. Basically, the LibDems running DECC under the UK coalition government have stuck to Little Ed Miliband’s script and the Greenpeace-drafted generating policy legislation he put in place, augmented by subsequent similarly “green”-driven EU legislation and their own insanely anti-carbon convictions. With the result that our energy supplies, and with them our economic prospects, are now in the hands of China, France, Germany, Qatar, Russia, etc. All with the overall result that we are b…..ed for the foreseeable future. I call them climate ‘muddles’. Russia has strongly criticised the secretariat of the United Nations Framework Convention on Climate Change for failing to be impartial and breaking rules of consensus-based decision-making during recent negotiations. It has asked that the talks beginning November 11, 2013 at Warsaw decide on a voting process for decision-making. The other (previous negotiatorone noted that the Russian proposal had come too late in the day and by procedure only proposals made six months before the annual talks can be ) formally accepted as part of a draft agenda. This draft agenda is then affirmed by all countries before it’s even discussed formally through the two weeks of talks. The report on trends in global emissions has been produced annually by the Netherlands Environment Assessment Agency and the European Commission’s Joint Research Centre. It finds that emissions of carbon dioxide reached a new record in 2012 of 34.5bn tonnes. There were two important factors in reducing China’s CO2. The first was the ending of a large economic stimulus package. As a result electricity and energy prices increased at half the rate of GDP. With all due respect, no one in authority is going to speak out against it. The relationship between alarmists and governments is incestuous. The alarmists provided a great excuse to curtail liberties. But it is failing. Governments had the means in their hands, but now it is slipping away, so they are doubling down (both sides – government and alarmists – as evidenced by the lack of science and the proliferation of spite and vindictiveness). They won a couple of hands at the poker table, but are losing now, and throwing more money hoping for a change of luck. remember hearing about that 5″ closing it and thinking I don’t even fire up the tractor (with snowblower) for 5″ usually. where I worked at KBGR we’d maybe get concerned at a foot at wrong times but the crews there did good job, never remember runway being closed for snow/ice (active air guard base for 101 refueling wing) and I often myself plowed our hangar area for taxiing a/c. “All of the climate models and policy-relevant pathways of future greenhouse gas and aerosol emissions considered in the Intergovernmental Panel on Climate Change’s (IPCC) recent Fifth Assessment Report show a long-term global increase in temperature during the 21st century is expected. In all cases, the warming from increasing greenhouse gases significantly exceeds any cooling from atmospheric aerosols. Other effects such as solar changes and volcanic activity are likely to have only a minor impact over this timescale”. I have no Sunspot Number data before 1700, but the latter part of the Maunder Minimum had 2 back-to-back low Solar Cycles with SSNmax of 58 in 1705 and 63 in 1717 . The coldest period of the Maunder was ~1670 to ~1700 (8.48dC year average Central England Temperatures) but the coldest year was 1740 (6.84C year avg CET). The Dalton Minimum had 2 back-to-back low SC’s with SSNmax of 48 in 1804 and 46 in 1816. Tambora erupted in 1815. Two of the coldest years in the Dalton were 1814 (7.75C year avg CET) and 1816 (7.87C year avg CET). Now Solar Cycle 24 is a dud with SSNmax estimated at ~65, and very early estimates suggest SC25 will be very low as well. The warmest recent years for CET were 2002 to 2007 inclusive that averaged 10.55C. I suggest with confidence that 10.5C is substantially warmer as a yearly average than 8.5C, and the latter may not provide a “lovely year for Chrysanths”. I further suggest with confidence that individual years averaging 7.8C or even 6.8C are even colder, and the Chrysanths will suffer. IF the Sun does indeed drive temperature, as I suspect, Baroness Verma, then you and your colleagues on both sides of the House may have brewed the perfect storm. You are claiming that global cooling will NOT happen, AND you have crippled your energy systems with excessive reliance on ineffective grid-connected “green energy” schemes. I suggest that global cooling probably WILL happen within the next decade or sooner, and Britain will get colder. I also suggest that the IPCC and the Met Office have NO track record of successful prediction (or “projection”) of global temperature and thus have no scientific credibility. I suggest that Winter deaths will increase in the UK as cooling progresses. I suggest that Excess Winter Mortality, the British rate of which is about double the rate in the Scandinavian countries, should provide an estimate of this unfolding tragedy. As always in these matters, I hope to be wrong. These are not numbers, they are real people, who “loved and were loved”. They will stop spewing this lunacy when we are able to attach a political price tag to it. Not a minute before. The IPCC’s projections were in sight until the standstill. Then they blame………nothing, yet. They really don’t know yet the UK govt is clear about the future warmth yet the IPCC does not know what is happening. This is settled science. The IPCC does not know yet the UK knows it’s settled. Does the UK government know that the IPCC does not know why global warming has stopped? but it’s my fault it got this long. I wonder whether I’ll be around to have one great last laugh at China’s expense. Thanks to Nixon, Kissinger, Bush 41, and BJ Clinton, China has robbed us for over 30 years and built a powerful economy, and shiny new cities. There are many predictions of China’s imminent economic collapse. China will get through any recession in fine shape. However, it will be interesting to see the country about 30 years from now. Sadly (for me), I might miss the ugly finish 50 years hence. I have little doubt the mad construction, glass towers, bright lights, and amazing roads will age. With it all being built (almost certainly) to shoddy construction standards, the aging process will be rapid. Recall what happened to Japan around 1993, following decades of rapid growth after WW II. In the case of China, the scale is larger by at least a factor of 10. Costs to rebuild their infrastructure will be very high; no doubt wages will have increased and there will be no giant American economy to plunder. Replacement will be harder to do than building fresh. Moreover, the one-child policy will leave China with a small base of labor relative to the aging population it must support. Social costs could be crippling. Is there a way out? Horrible thought: If the Communists retain control, perhaps the elderly will be persuaded to make one final long march into oblivion in order to save the nation. Or, perhaps the plan will be to exploit the lesser nations in Asia and bring in workers who might work for next to nothing. The final crushing blow to China I would never laugh about is their horrific pollution. Nature might not clean up that mess in centuries. Groundwater is particularly hard to clean. It will make life very risky in areas lacking technology to provide clean water, and where people must eat contaminated locally grown food . The end will be signaled if their children start dying in large numbers . Using technology to clean up their mess will also be very expensive . I’ll concede their economic victory, mainly because our national debt is over $17 trillion and rapidly rising . But what will winning cost them? If they decide to crush us, it may cost them everything. Within 20 years, I hope our doomed experiment with socialism will be over and we will have a renewed interest in real education and free market capitalism. We are headed for a severe crash, much worse than 2008. Nevertheless, I expect we will recover. The sooner we return to local control over education, smaller government, and real free market capitalism, the sooner we will rebound. China will eventually recover after they hit bottom, but it will take a long time. If our economy recovers in time, we might be able to help even if only as a more equal trading partner. If economic and environmental turmoil lead to war, it will be due to politicians pointing fingers at others to escape responsibility for problems they caused. These days, government doesn’t solve problems, it only creates them. Problems make government seem more necessary. The people generally find solutions themselves if government stops meddling and controlling. We only need limited functions of government. Providing limited government was the intent of the US Constitution. Why didn’t we think of just following the Constitution? Let’s do that! Well, maybe with a few more checks and balances added to avoid repeating the mistakes of the last century. Yes, the news you pointed out is maddening. At least we have the GWPF being invaluable by giving us this kind of news reporting, though it is maddening news. Without the likes of organizations like the GWPF we might be complacent. They give us what we need to focus on. Lindzen is one of the notable associates of the GWPF as is Ridley; among many other notables. Well that confirms it, Baroness Verma has shown herself to be about as useful as “Mystic Meg”. (UK readers will know what I mean). It will take someth8ing I really don’t want to wish for, because of the injury it will do to so many – but the only thing that I believe is likely to stop this madness is a series of 15 or 20 years of crushingly cold winters and weak summers. This news cannot be repeated often enough: unmitigated joy. Carbon Dioxide in the atmosphere is the very stuff of life. But it is as if many western politicians, much of the scientific establishment, and all Green Global Warming advocates have all collectively and conveniently forgotten all their elementary school biology about photosynthesis and the carbon cycle. As a result, the Western world has been forced into a massive guilt trip with endless predictions of impending global catastrophes from the over production of CO2 by mankind. But in reality added CO2 is the essential food for plants and its present increase has already contributed to the fertility of the planet, for example in the greening of the Sahel. Mankind’s use of fossil fuels simply releases the very diffuse and intermittent energy from sunlight converted by plants over many millions of years, that has been conveniently concentrated and stored by earlier geologic processes. And its release back into the biosphere now is to the benefit of all plant life and the wellbeing of the biosphere. So it is possible using IPCC data to do some rough and ready calculations on the future impact of added man-made CO2 emissions. In round numbers, the major proportion (~95%) of the 33°C greenhouse effect is caused by water and clouds in the atmosphere. Atmospheric Carbon dioxide is indeed also a greenhouse gas but it only contributes marginally (possibly less than ~5%) to the warming effect. However at the current level of ~400ppmv CO2’s ~93% of its available effectiveness is already used up, because even according to the IPCC, its effectiveness diminishes logarithmically as its concentration increases. Additional CO2 emissions can now only ever add a maximum of ~7% additional effectiveness of its limited warming effect in future. So very roughly the maximum additional temperature effect of continuing to emit unlimited amounts of CO2 is 7% * 5% * 33°C = ~0.11°C. Of which if EU(27) were to eliminate half its ~11% of world CO2 emissions would amount to ~0.006°C and the concomitant effect of halving the UK 1.5% of world CO2 emissions would only be ~0.0009°C. These effects mean that all the de-carbonization efforts involved in the UK or Europe can only ever be immeasurably miniscule and thus irrelevant and entirely futile. Global Warming Advocates only ever emphasize the catastrophe that awaits the world in the future as a result of Man-made Global warming. They should note that more adverse weather (like the St Jude Storm) is more likely to be a symptom of world cooling as the energy differential between the tropics and the poles increases. Increased levels of CO2 and a slightly warmer climate within natural limits can bring real benefits to mankind. The world could well survive having additional areas available for viable, well fertilized, agriculture. Instead it is likely that any current global warming (or rather current cooling) is a almost entirely a natural process, is within normal limits and is probably beneficial to Mankind even up to a level of about an additional +2.0°C. Sadly though warming may be not now even be occurring at all in the coming century. Thus the probability is that any current global warming is not man-made and in any case it could be not be influenced by any remedial action, however drastic, taken by a minority of nations. That prospect should be greeted with unmitigated joy. * all concern over CO2 as a man-made pollutant can be entirely discounted. * if warming were happening it would lead to a more benign and healthy climate for mankind. * any extra CO2 has already increased the fertility of all plant life on the planet. * if warming is occurring at all, a warmer climate within natural variation would provide a future of greater opportunity and prosperity for human development, especially so for the third world. As global temperatures are already showing cooling over at least the last seventeen years or more, the world should fear the real and detrimental effects of global cooling of an advancing Maunder Minimum event rather than being hysterical about limited mainly natural or now non-existent warming. * toxic environmental pollution. (Whatever is asserted CO2 is neither toxic nor pollutant). * rain forest clearance, especially for the production of biofuels. * biosphere destructive industrial farming at all levels. * wild habitat destruction throughout the biosphere. * many green and renewable energy activities actually detrimental to the environment. The World Organizations, the UN and the UK’s Greenest Government Ever should indeed be strenuously finding ways to improve these situations. But the unwarranted concentration on reducing CO2 emissions has deflected even well-meaning green activists from these more immediate and more worthwhile objectives. This great news cannot be repeated often enough. Steve Baker: We have agreed here that science proceeds by conjecture and refutation, so in an attempt not to have a cloying consensus, will the Minister fund some climate scientists who wish to refute the current thesis? In spite of the enormous costs and appalling waste it is clear that the powers that be do not want to hear the good news that there is no real problem needing to be tackled. It is now estimated that Climate Change policies in Europe alone will cost ~ £174,000,000,000 annually by 2020 or about 1.5% of European GDP. But this figure does not include the attendant losses to Europe of industries already leaving the EU for regions with cheaper energy resources and more rational energy policies. With the quantity of cr*p that has to be regularly pumped out by the likes of Verma to further The Cause, you can see why it was important to TPTB to make sure Lord Monckton was barred from sitting in the Lords. It’s just another promise by a politician and therefore it will not last much past the next election, so by about the middle of 2016 we’ll being told that the climate is cooling and we must be taxed more and it was all the previous lots fault. I can understand why they used to lock them away in the Tower or behead them now. It’s not so much what Verma did say as much as what she didn’t say, namely the areas of climate knowledge (uncertainty) denied to her by the soothsayers she consulted. One area of knowledge she ought to learn of is the declining magnetic field strength of the sun and the potential implications that may have for temperatures here on Earth. She, like the IPCC, failed to even acknowledge the possibility that the climate may actually cool. Given the essentially chaotic nature of climate and the historical record, cooling is a very real possibility and a far greater threat to civilisation. She has allowed herself to be fooled by the so called experts. How does that Feynman quote go? The vermin of which we speak is unelected, a prime creator of the climate change act and vested in mind and wallet. She will spend the rest of her life denying her part in increased cold deaths, impoverishment of the children of the realm and her immeasurable stupidity. Since her response is framed around the IPCC model ensemble and only the model output, her response is entirely ‘accurate’. It doesn’t mean that it is a true reflection of reality, just that it is accurate. Kind of like physics exams I used to take where the prof would give you some credit for a wrong answer derived from incorrect data, they would write ‘correct for data’, implying you used the correct method to solve the problem but your initial data was incorrect. So her response is ‘correct for data’. The last statement, ” Other effects such as solar changes and volcanic activity are likely to have only a minor impact over this timescale” isn’t inaccurate, it is just unjustified, especially the volcanic activity. Is the UK MET Office capable of predicting volcanic activity over century timescales? She might be right, she might be wrong. However, again, the statement is derived from model output and only model output (a nice circular logic chain ensues), but, the models are designed to allow only a minor impact from solar & volcanic activity so it’s little wonder that the model output shows little effect from solar and volcanic activity. What about model outputs other than temperature? I would guess that most of the models with high temps are dependent on other outputs that are even further out of step from reality than temperature outputs. There are so many people with so many vested interests in the continuation of the myth it won’t be easily stopped. …could be persuaded to look into it and publicly report it might slow things down a bit (in the UK at least). All of our best weather models predicted the DFW metroplex to get between 2-4 inches of rain on October 30th/31st not more than 24 hours before the rain event was to begin. Final tally at DFW airport = 0.11 inches. True, but I think you are an American, and may not be familiar with the way the British Parliament operates. The US has a written constitution, and the rules for Congress are written down. The UK does not have a constitution, and there are few rules; only precedent. The Canadian Parliament operates the same sort of way, so I am familiar with how the UK operates. An answer to a question must be factual, but it does not have to answer the question. There was a recent incident in the House of Lords where the same, identical, question was asked 7 times, and received 6 answers that were factual but irrelevant. The 7th time the question was answered. But there is another tradition that the answer must not mislead the House. I would suggest that Baroness Verma’s answer was misleading. Nial, you suggest opposition might come from the engineering community. I personally, would welcome official opposition from any accredited organization. The difficulty is finding one with the courage to do so. I notice that the chart has two keys. One says that the circles are the average of two baloons. The other says the circles are the average of four baloons. Careless mistakes like this, if discovered, can be damaging to the cause. Sorry, posted that on wrong page. As for the politicians and CAGW proponents in academia, probably not anything we can do until we undermine their popular support among the masses. So how do we do that? The problem is that the regular CAGW supporter has no idea what the facts are; that at least is what my experience in trying to speak with them indicates. No matter what data, what facts, what logic you present to them, nine times out of ten, their response is “but 97% of all scientists say you are wrong!” No thought, no analysis, no argument of data — just the ill-informed 97% response. The problem is that the thought of controlling CO2 has overshadowed all these immediate, important and worthwhile activities even for well-meaning green activists, whilst as you say wishing the best for their fellow humans. She was inaccurate. What she said is not observed in the actual Earth-Atmosphere System (EAS). The observed EAS prevails over her assessment of the IPCC’s model derived assessment. Actually, B Verma is setting up the IPCC for the fall guy. Thanks. Sad to say, but your analysis is absolutely right, especially about the sub-standard infrastructure. Isn’t this at least a falsifiable claim? In the UK there is total subservence to the scientific elite…and .the politicians believe every word of it and with few exceptions never do their own research. The BBC which is influenced in so many areas by the Guardian view of the world is no longer fit for purpose. They refuse to give a balanced presentation of the facts and have effectively told us to shut up….no debate. It’s over. Well the chickens are coming home to roost…we can see it….but our politicians and media have swallowed the AGW fantasy hook line and sinker to the point where those of us that disagree are looked on as mad…in need of educating. It’s that bad, they have no idea. If climate science had to undergo quality assurance testing and not the really soft option of peer review there would be no talk about pauses. Instead the QA people would have demanded that the deviation be explained immediately. Obviously it is not possible to predict random events that cause the noisy temperature behaviour but in the following year there is no excuse for not getting a perfect match every year if they had the correct explanation for the climate’s behaviour. The models would have to be rerun using actual data on CO2 and all differences justified using data on any irregular events from the preceding year. That is of course if they scientists had got away in the first place with not dong the models for at least a hundred different zones and proved that CO2 explained the behaviour in all of them equally well. Just emailed Lady Verma with a couple of questions. 3/ If not carried out comparison, explain why she thought this inappropriate use of time. Thast could be me for a spell in the Tower but you got to start somewhere. As for a couple of degrees of warming, it won’t make much difference here as the temperatures vary 60 degrees Celsius every 6 months. Is there a tradition in Parlament that a Secretaries and Under-Secretaries can not be subject to votes of “No Confidence” no matter how obtuse and misleading their answers? Are votes of “No Confidence” limited to bringing down the Prime Minister? Scientists at the Climate and Environmental Physics and Oeschger Centre for Climate Change Research at the University of Berne in Switzerland back up theories that support the Sun’s importance in determining the climate on Earth. In a paper published this month by the American Meteorological Society, the authors demolish the claims by IPCC scientists that the Sun couldn’t be responsible for major shifts in climate. In a post on her website this month, Judith Curry, Chair of the School of Earth and Atmospheric Sciences at the Georgia Institute of Technology, all-but mocked the IPCC assertions that solar variations don’t matter. Among the many studies and authorities she cited: the National Research Council’s recent report, “The Effects of Solar Variability on Earth’s Climate,” and NASA, former home of global warming guru James Hansen. “global increase in temperature during the 21st century¨? What increase? I certainly don´t see any global increase in temperature in 21st century. Went the british government so haywire that they still believe the crooks from the IPCC even after the chain of the unusually cold winters which already costed them fortune? This looks one can say only the infamous yes minister. Have they been able to model the MWP that only occurred in Europe, lasting for 300 years, yet the rest of planet earth remained 3 degree’s cooler for the same period of time? Unsupported assertion by Slatts. When and where did “the heir” say that? Given “the heir’s” record on so many other subjects on which he spouts I’m surprised that Slatts accords him so much reliability. We poms don’t. Perhaps the only good thing about him succeeding his mother (eventually) is that he will have to stop making such foolish political statements. Stephen Rasey. I am no expert, but my understanding is the votes of no confidence are on the Government, not individual ministers; including the Prime Minister. Such votes only occur in the House of Commons. I believe the procedure to challenge Baroness Verma would be to move a Point of Privilege; which takes precedence over all other business. This would be an appeal to the Lord Chancellor to rule that BV had mislead the House. It would then be up to the Lord Chancellor to rule whether the House had, in fact, been mislead. Precisely what sanctions occur if the Lord Chancellor rules that the House has been misleads, I don’t know. As you can imagine, such a ruling would be very rare indeed. Sandip Verna has exactly the right qualifications to be Parliamentary Under-Secretary of State, Department of Energy and Climate Change. After school she “embarked on higher education courses in psychology and then a business degree, successfully operating a high fashion hosiery business before setting up in the service sector with a care business”. As she had twice been defeated as a parliamentary candidate David Cameron made her into a life peeress. She ticked all three of the right boxes. She was a conservative, she was a woman and she came from an ethnic minority. But why put her into the Dept. for Climate Change and not the Department for Business Innovation and Skills where her real background and talents appear to lie? Sadly we do not have anything resembling a deocracy here in the Britain. I was amused by Craig at 4-01 who did a good parody of the state of play. that they are CAGW sceptics. By the way 100% of short putts never go in the hole Craig. Yesterday we had the highest tide of the year here. Someone wondered if the high sea level was connected to Global Warming. This prompted me to pen the following ditty. When the sea is out of reach. With a massive load of ice. From the sea up to my door. They do not rely on scrys. My wife asked me what the source of the graph in the article is and I could not say. Please publish a title and source so she will feel it is valid to discuss the graph with me, she is a tenured STEM professor who scoffs at opinions. Zek202, you ask for the origin of the graph. I did not put it up; Anthony did. I am almost certain it is the one quoted in the latest IPCC AR5.. I will check to see if \I can find it. Zek 202 I am pretty sure this is correct; but I cannot be certain. The graph above was produce by Anthony. The original can be found in the IPCC AR5 Chapter 11, Figure 11.25. Perhaps we ought to take a close look at Baroness Verna’s statement before deciding whether or not she is being misleading or incorrect. She opens with …. All of the climate models and policy-relevant pathways of future greenhouse gas and aerosol emissions considered in the Intergovernmental Panel on Climate Change’s (IPCC) recent Fifth Assessment Report show a long-term global increase in temperature during the 21st century is expected. True – and a statement that the likes of Richard Lindzen and Roy Spencer among others would probably agree with. Note that there is no attempt by Verna to quantify the “global increase in temperature”. In all cases, the warming from increasing greenhouse gases significantly exceeds any cooling from atmospheric aerosols. Again – very likely true. We’ve seen a fairly average solar cycle 23 and are currently witnessing a weak solar cycle 24 with no obvious drop in temperatures. If there is a weakness in Baroness Verna’s case it is the magnitude of the expected warming. It is this that must be challenged. Unfortunately, the ‘sceptic side’ insist that (take your pick) (a) there is no warming (b) it’s all down to the sun (c) CO2 causes cooling (d) the increase in atmospheric CO2 is nothing to do with human activity and (e) I’m sure there are others I’ve forgotten. There is a reason that climate models have over-estimated warming and that is because they over-estimate feedback and, as a result, over-estimate Climate Sensitivity. 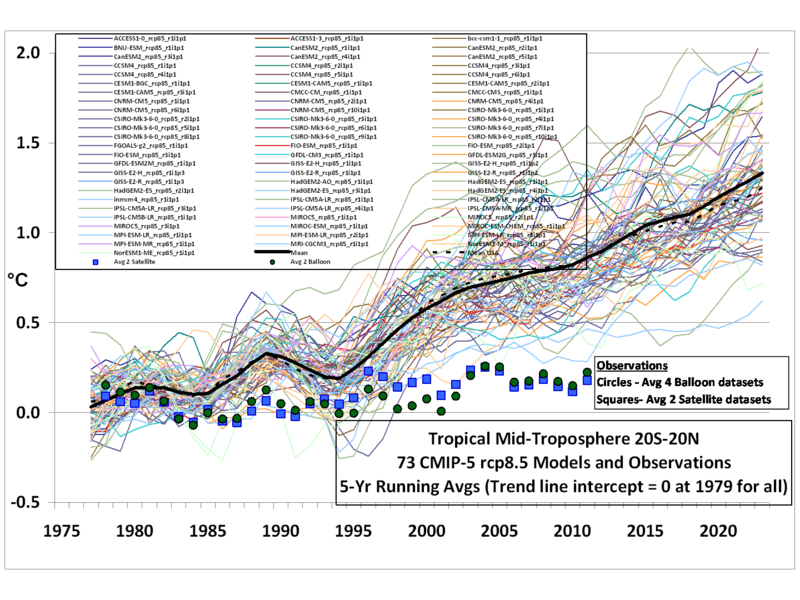 There will be warming over the coming decades but not at the magnitude projected by the models. That’s the issue we should be focusing on. John Finn likes theose assertions. Problem is, that’s all they are. Saying, “Very likely true” does not make an assertion true. It is simply another baseless assertion. In statistical terms “very likely” has a meaning. 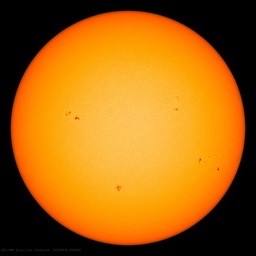 The evidence to date tells us that solar activity is unlikely to have a major influence on the mean global temperature. However, talking of baseless assertions. On another thread you posted a number of comments in which you suggested I was a “supporter” of the Mann et al hockey stick – despite the fact that I never mentioned the Hockey Stick. You clearly didn’t see my final post on that thread, so let me draw your attention to this WUWT post from 2009. Back in December 2004 John Finn asked about “the divergence” in Myth vs. Fact Regarding the “Hockey Stick” -thread of RealClimate.org. So have you got that? In 2004, a full 5 years before Climategate, I was challenging Mike Mann about the divergence between the proxy data and the thermometer record. This divergence was the reason for the ‘Hide the Decline’ trick. After going through the entire thread you linked to, with more than 300 posts, I cannot find your comment. Or a comment that I made, for that matter. Maybe my eyes were glazing over, that’s possible. Also, if I may be redundant, saying, “‘Very likely true’ does not make an assertion true.” Which was my original point. You also declare that certain things are “Undoubtedly true”. It must be wonderful to be so certain. But no skeptic would be that certain. Probably something to do with the strawman arguments you introduced. Grow up. You referredto specific comments, which I can’t find. If there is a comment you want me to read, post the time and date and I’ll read it. I have linked to the WUWT post and directly to the Realclimate post elsewhere on WUWT. This was in response to your accusation I am a “Hockey Stick” supporter. The links provide clear evidence that I have challenged Michael Mann himself on the Hockey Stick graph. In particular I challenged him on the “Hide the Decline” trick. The online exchange between Mann and myself took place in December 2004. This, then shows, that I was aware of the “trick” (if not the exact detail) in 2004 – around 5 years before “Climategate”. John, anyone who claims, as you did, that global temperatures are recently accelerating is, IMHO, a hockey stick supporter. The long term rise in global T is not accelerating. Graphs upon request.